The Tabby Business Awards are a global competition for excellence in business and enterprisse Apps. Twenty judges reviewed apps from a dozen countries and selected the top 75 Apps for 26 categories. Winners will be named in Novermber. 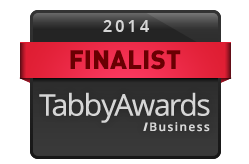 See http://tabbyawards.com/business/2014-finalists/ for more details. iQagent was named in both the 'Intelligence, Information or Reference' and 'IT or Business Tool' Category.